Air New Zealand commenced a weekly service by Boeing 767 ZK-NBA. Inaugurated by Royal Tongan Airways Boeing 737-200 H4-SAL leased from Solomon Islands Airlines. Although the Tongan Post Office had announced that mail would be flown to Auckland, N.Z. Post only decided to place mail on the flight to Tonga shortly before departure time. An unofficial cachet was used on some Tongan covers. Was operated by Vincent Aviation Company using VH-KAM. This service was originally scheduled to commence with Riley Heron ZK-TAJ which arrived by sea from Launceston, Tasmania but was not granted a certificate of airworthiness. It is not known if any unofficial mail was carried on this service. Special flight of the Beriev A-40 Albatross amphibian to Air Expo '92 which was held at Auckland International Airport. The route was Taganrog-Dubai 11 Nov, to Colombo on 12th, Jakarta on 13th, Perth 14th, Sydney 15th and Auckland on 20 November. 10,000 souvenir covers were flown from Russia and were backstamped on arrival with the Air Expo '92 cachet. 500 covers received the HYAT OFFICIAL AIR EXPO DINNER cachet, a "Russian Manufacturers" cachet was applied to a further 250 and final 1,000 received the "Air New Zealand Limited Edition" cachet. The aircraft also carried 160 miscellaneous Russian covers. By A340-200 Airbus F-WWBA jetliner in 21 hours 31 minutes. The Airbus flew from Le Bourget Airport, Paris to Auckland International Airport, a distance of 19,808km, and after a five hour refuelling stopover, flew non-stop back to Paris. The route from Paris took the aircraft over Hamburg, Siberia, Japan, Solomon Islands and New Caledonia to Auckland. Four pilots, including Pierre Baud, Nick Warner and Gerard Guyot were used. Some official letters were carried to various dignitaries. Air New Zealand inaugurated a return service with Boeing 767-300 ZK-NCF. The airline produced special souvenir covers depicting the flag of South Korea. Internal Flights: 1993, 19 Nov. / 1993, 24 Dec.
Air mail by Charles T.P. Ulm. Approximately 110 special covers were prepared by the Aeropex 94 committee in Adelaide and sent by packet post to the Chief Post Office, Auckland where a special "inkjet" two-line cancellation was applied. This reads "AUCKLAND NZ FEBRUARY 17 1994 - 60TH ANNIVERSARY TRANS TASMAN AIRMAIL". (Note incorrect spelling of February) This is the first known use of this type of special commemorative cancellation in N.Z. The covers were flown to Sydney on a scheduled commercial flight and received a special postmark at the Sydney International Airport on the same date. Specially prepared aerogrammes are known, with cachets, for both flights. 250 specially printed flight covers were carried by a Consolidated PBY-5A Catalina flying boat from Harare to Auckland (backstamped 26 Oct). Internal Flights: 1994, 29 Oct. / 1994, 16 Dec. / 1994, 16 Dec. This solo flight was made by Jon Johanson in a Vans RV4 aircraft, reg VH-NOJ. 10 signed covers and 10 postcards were flown. Internal Flight: 1995, 17 Feb. This solo flight was made by Jon Johanson in a Vans RV4 aircraft, reg VH-NOJ. Franked with $1 Australian postage and also NZ $1 postage and pilot signed. 10 covers and 10 aerogrammes were flown. Trans Air Philair Club airmail postcards are known flown both ways. The flight from Japan also called at Christchurch. Internal Flight: 1997, 13 Nov. 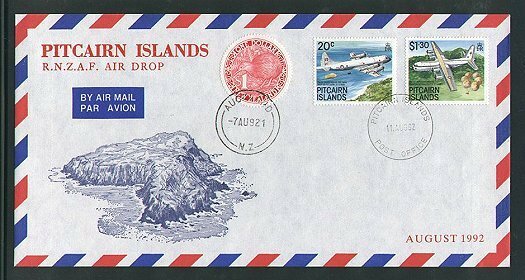 Illustrated covers were issued by the AMSNZ and these were postmarked at Auckland with a special inkjet cancellation reading "60th Anniversary NZ-USA First Airmail" and then flown by Air NZ to Hawaii and datestamped at Honolulu, 2 Jan. The Trans World Philair Club (TWPC) organized special pictorial postcards to be used at Frankfurt for the first flights from there to Christchurch via Singapore on 20 July and to Auckland via USA on 24 July. The covers bear various cachets and cancels. The 3 August flight was the first using the Boeing 767 from Singapore. An RNZAF Hercules flew to Antarctica on 12 October and returned the following day Some mail, consisting of Shades Stamp Shop's Air Polarogrammes No 11 was carried. The 50c label produced by Fort Augustus Marketing for the Wanaka air show in April was affixed to a special souvenir cover and tied with a circular cachet. To this was added a $1 NZ Post stamp and the covers were flown to Sydney. Covers franked with a USPO meter at the South Pole Station were carried by a US ski-equipped Hercules via McMurdo to Christchurch Airport. An Indian stroke victim was taken from a Norwegian vessel via a South African helicopter and German Twin Otter to the South Pole for transfer to the US plane. Shades Stamp Shop's Air Polarogrammes No 11 were postmarked on 12 Feb at the US Air Force Postal Service APO at McMurdo and flown to and from the South Pole on 14 Feb and then to Christchurch on 17 February. Shades Stamp Shop's Polarogrammes No 17 were postmarked 15 Oct at McMurdo APO and flown on a Hercules to the South Pole and back to Christchurch. Covers were taken on this flight and datestamped on return at Christchurch with Ross Dependency Agency postmark 18 Oct.
Internal Flight: 1999, 17 Nov.
By Airbus A330, Transworld Philair Club air mail postcards are known postmarked at Noumea Magenta. A Concorde visiting Christchurch for several days took some covers to Australia. 1500 flight covers from China were backstamped at Auckland on arrival.